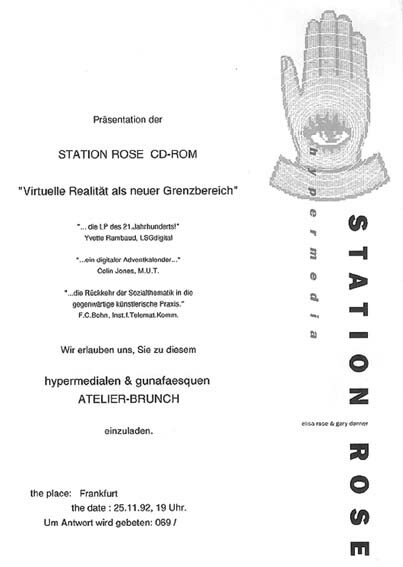 D_ CD ROM "Virtual Reality as New Grenzbereich"
This was Station Rose´s first CD-ROM production, and maybe the the 1st art cdrom, at least in Europe. It was actually a CD Plus (CD ROM with 3 audio tracks), which has been produced in cooperation with and sold at newsstands as supplement with german "Chip Inside" magazine. This was the 1st home-studio STR had in Frankfurt, equipped with computers, soundsystem & the internet. In here STR produced CDROMs, composed their AV-performances and went online on a daily basis.